The war of words continues on the proposals to impose Quality Contracts in the Tyne and Wear area. Bus companies say they will not rule out taking legal action over plans to change the way services are run and financed in the region. The Tyne and Wear Integrated Transport Authority (TWITA) says it wants to run services on particular routes and be paid a set amount by bus companies for doing so. The authority say the Quality Contracts scheme would "simplify" bus fares and make them "more affordable". But bus operators say the idea is "flawed" and want to try and block it. Stagecoach, Go North East and Arriva have invested heavily in the Tyne & Wear area. Go North East and Arriva continue to do so but Stagecoach have ceased buying new vehicles until the threat to their business is removed. 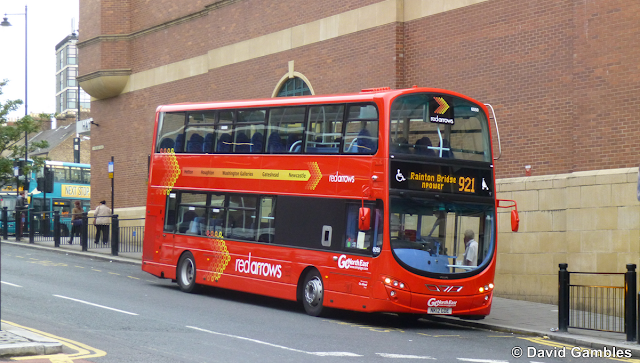 This is one of the recently introduced Volvo B9TL's recently introduced by Go North East. Under the new scheme, the five councils that make up the transport authority will keep the fares collected, but they will then have to make up any shortfall between this money and the cash paid out to bus companies.The authority also claims the idea would enable some loss making routes to be kept open. The North East Bus Operator's Association (NEBOA) says the Quality Contracts idea is "flawed". Chairman Kevin Carr said: "The quality contracts are going to be very very expensive. "They do rely on passenger growth and if passenger growth is not there then it could be very very expensive and the ratepayer will have to subsidise the difference." He added that legal action could be a possibility if the two sides cannot agree. "At the end of the day the business would be at risk and we just couldn't afford to lose a business within the north-east of England and therefore we'd have to do everything in our power to ensure we maintain our operation," said Mr Carr. Houghton and Sunderland South Labour MP Bridget Phillipson has set up a petition to drum up support for the Quality Contracts idea, collecting hundreds of signatures. She says councils in the region are already putting tens of millions of pounds into financing bus travel and wants them to have more control. She said: "What this system would deliver is greater transparency about how that money's being spent but also it would give local people more of a voice because they are frustrated that there isn't one simple ticketing system, that they don't have a say when routes are cut." However, not all politicians are convinced that the Quality Contracts idea, which is already operating in London, is the best way forward. The Integrated Transport Authority is also considering another idea - a new partnership between bus firms and councils. Some think adopting this idea could be a middle way and end any danger of legal action. Newcastle Lib Dem Councillor Greg Stone is a member of TWITA. He said: "What could be achieved by a voluntary partnership arrangement between the public and private sectors would lead to better results for both sides on this. "I think the way we're going is going to lead to a war between the transport authorities and the bus companies. "That will only end up hurting the passenger in terms of the cost to the taxpayer and the cost of a legal battle which I think is looming large on the horizon now, and with the way the Quality Contracts proponents want to go I can't see the bus companies taking this lightly."